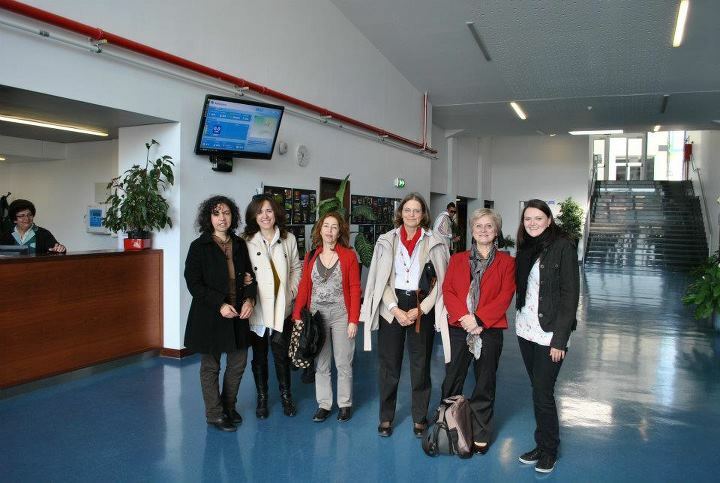 During the Lisbon meeting (April 2012) of ECLIPSE, Consortium partners had the opportunity to visit a school that will participate in our project in Lisbon from September 2012 to April 2013. It is the Escola Secundária de Pedro Alexandrino and it was a really interesting visit. The school gives a good picture of the innovative efforts of the school system in Portugal, it offers not only a wide range of courses to the pupils in school age (ENSINO BÁSICO Regular, 7o Ano 8o Ano 9o Ano), it even offers courses for adults empowering their personal and professional skills (EM REGIME PÓS-LABORAL, CURSOS DE EDUCAÇÃO E FORMAÇÃO DE ADULTOS, ENSINO RECORRENTE). The headmaster Ms Rosário welcomed us and gave the first information; Mr João Barros guided us during the visit and other teaching staff were very friendly and hospitable in receiving us and showing the building, the activities, the work and some projects. The school building, the rooms, the laboratories, the green areas, the sport spaces, and the cafeteria allow a full time life in the school with every kind of activity and meeting opportunities. Visiting the school helped us to understand something about the Portuguese school system, f.i. the marks of the pupils are public in Portugal; we could see that handicapped pupils receive assistance and share the common learning on the school. The school offers a full range of opportunities and is open until late in the evening, offering education to adults too. The most important message that we could have in the school was the active atmosphere, the commitment of all the teachers and the friendly motivating social climate. Thank you for this visit! Mi visita a la Escola Secundária de Pedro Alexandrino fue un auténtico placer; es un modelo de centro por sus instalaciones, el lugar donde está ubicado y por sus proyectos educativos tan interesantes e innovadores. El equipo del centro nos explicó con todo detalle las iniciativas educativas y nos mostró las aulas, laboratorios e instalaciones, que son esplendidas y bien cuidadas. Mi percepción es que el centro tiene un equipo educativo implicado y entusiasta, que vive con pasión su trabajo, y que tiene como meta la mejora de la calidad de la educación. Already when we entered the school in the morning I could feel the good atmosphere. That was also probably due to the nice weather in Lisbon. Hardly in the school had come we are immediately welcomed by the headmaster Ms Rosário and other teaching staff. Mr João Barros who guided us was very friendly and kindly during the visit. Also the atmosphere among the children and teenagers was good. Curious views accompanied our arrival. During the visit we got an introduction into the daily routine of the school. We have been informed that the school is already engaged in some European projects and that they also have they own small projects. The teachers showed and explained us the different departments in which the school is organized. We could see the school’s own repair shop as well as all buildings of the school which are split very generously and lie in the green. In the big break we were sitting together in the cafeteria with a few colleagues. At that time the school’s own radio is switched on which impressed me very much. The students can learn here for example personal engagement and new ways of the learning which means a strong orientation towards the social environment. In general this visit clearly showed the support as well as the career advancement of the independence of the students. At the end of the visit I left the school with positive impressions and the question how schools also should be in other countries. We know that education is essential for young people. A good and professional education at school is very important. Additionally it can offer a way out of difficult situations as it is the case in some European countries.